Understandable by Design: How Can Products be Designed to Align with User Experience? Understanding users increases the likelihood that the final designed product will meet the needs of heterogeneous people (Kouprie and Sleeswijk Visser, 2009). However, the process of learning to understand users and their experiences requires qualitative research (Mattelmäki and Battarbee, 2002) and a structured investment of time that can be achieved through the development of a manageable design plan in the early stages of design (Yang and Epstein, 2005). 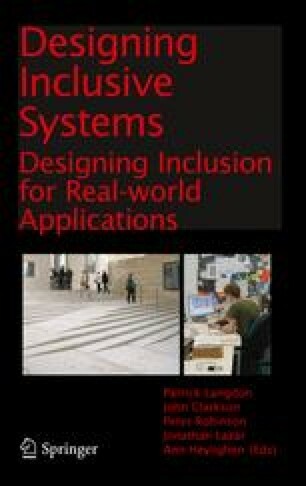 Although the fields of accessibility and usability have made significant advances in the last decade in facilitating the design of products and services that satisfy the needs of different users and are easy to use, the majority of design companies still fail to acknowledge users’ needs early on in the design process (Gulliksen et al., 2003). This is because of, among other things, tight schedules and a limited budget (Dong, 2005).